Dominic Ball during his impressive debut at Swindon. Photo: Joe Dent/theposh.com. Debutant Dominic Ball enjoyed a strong debut as Peterborough United won their League One fixture 1-0 at Swindon today (January 21). 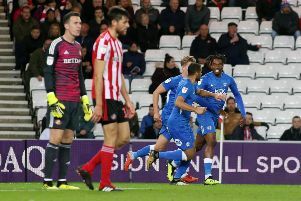 The centre-half, who is on loan from Rotherham for the rest of the season, was part of a much-improved defensive display. Posh right-back Michael Smith makes a clearance at Swindon. Photo: Joe Dent/theposh.com. Leo Da Silva Lopes: (for Edwards, 82 mins). Martin Samuelsen: (for Maddison, 86 mins).